The boxing movie, as a genre, is a fairly hit (no pun intended) and miss affair. They tend to follow the same patterns of underdog makes good, an origin story of a man from humble beginnings, who has literally nothing to lose, and whose final shot at the big time is not for fame or glory, but for respect and purpose. Journeyman may take the form of these legion films, but, despite the world in which our main character inhabits, it is by no means a ‘boxing’ movie per se. 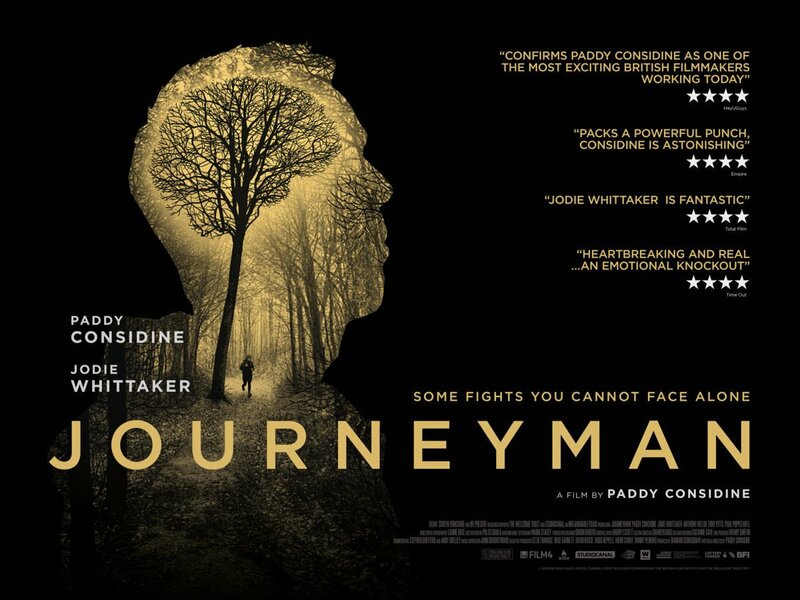 At the top of his game, professionally, and with a dedicated wife, Emma(Jodie Whittaker), and newborn baby at home, writer/director/star Paddy Considine’s Matty Burton enters the ring for one final title bout, which leaves him with a debilitating cranial injury and throws his entire life into upheaval. Considine is no stranger to the sport. Indeed, those who have followed his career over the years, will see many recurring themes, particularly in his physicality. From his debut in A Room For Romeo Brass, through Cinderella Man and myriad interviews in which the actor has discussed the importance of Raging Bull (or Bullring as he calls it), he has peppered his work with this world, be it shadow boxing in montages, or bobbing from side to side, as if battling an unseen opponent. There is only one fight in the film, shot with a rough and ready honesty that shows the brutality in all its disorientating glory. It’s only once the gloves are off and Matty’s unspecified brain trauma takes hold of his once comfortable home life, that the real battle begins. Whittaker is superb as Emma, although her character does tend to spend a lot of the second half of the pictrure in the shadow of Matty, as he takes his steps towards rehabilitation, not to mention redemption. The injury has robbed him of much, including his understanding of how to be a father and a husband, and the screenplay is fascinated by the minutia of Matty’s every move. As a director, Considine seems less interested in a particular visual style here, leaving behind some of the more expressive colours and shadows that peppered his debut film Tyrannosaur. In Journeyman, the ambitions might seem less cinematic, but the drama is sublime, at times heartbreakingly honest in its depiction of a man who, quite literally, has to start over. It is perhaps fairer to asses Considine as an actor here. For years now, he has been one of the best performers of his generation, and in Matty we may not have the role he was born to play, but there is no denying just how powerful a prescence he is. There is something inherently comforting about his naturalism. Charismatic when he wants to be, particularly in the pre-fight scrum, in which his opponent tellingly boasts that the fight will be a “life changer”, he also has a fine grip on the humanity behind his characters. There is a warmth to the man that makes him magnetic. In short, he is the beating heart of the story, his performance, never overplaying the disability, the real reason to see the film at all. Journeyman comes at a prescient time. With the recent post-fight death of boxer Scott Westgarth, horribly young at 31, the story stands as a testament, as much as a drama. Unlike many, Matty is given a second chance. Indeed, just as Considine explored the more twisted nature of male masculinity, and its devastating, wrecking ball-like effects on those around it, in Tyrannosaur, here he picks apart the conventions of the genre, and reveals instead a heartbreaking domestic drama, in which the biggest fights take place in living rooms, and the opponents are not rivals, but the ones you love the most.